Do Telfair and Fifth streets need a landscaped median? Should art adorn the Gordon Highway underpass? Those questions and more were posed to residents at a session Tuesday seeking feedback on proposed major overhauls to Telfair, Fifth and Greene streets. The plans are the work of Atlanta landscape architecture firm Cooper Carry, which released similar proposals for Broad, 13th and Sixth streets and James Brown Boulevard in November. The concept drawings are part of an estimated $83 million road project to be paid for by the Transportation Investment Act, a 1 percent sales tax for transportation, when collections amass in 2020 and later. Greene Street resident Beth Proctor eyed the “underpass art plaza” the plan showed under the Gordon Highway bridge where it crosses her street. “Really?” she asked. The obscured area isn’t safe – and “more foot traffic may or may not help,” she noted. Proctor and many who attended the input session and previous sessions on the sweeping plans raised familiar concerns about Augusta’s downtown. Gary Warner, project manager for Cooper Carry, said feedback has centered largely around the topics of maintenance – which isn’t funded by the TIA – loading, lane changes, trees and parking. California artists have taken over underpasses there such as the Gordon Highway proposal and made them “sacred places,” Warner said. 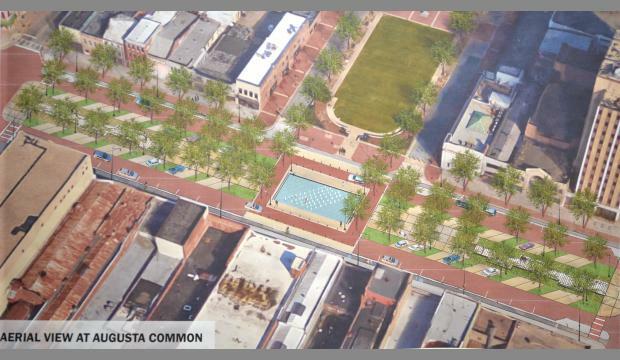 The proposals showed lanes removed from Telfair and Fifth streets and a landscaped median added to both. Greene gains pedestrian crossing zones and seating around its historic monuments. Elliott Caldwell, the complete streets coordinator for Georgia Bikes, applauded the inclusion of bike lanes on Broad and other streets. “That shows leadership,” to welcome bike and pedestrian traffic, “in the regional main drag” of metro Augusta, Caldwell said. And the city shouldn’t overlook making all its public spaces accessible to people with disabilities, insisted resident Dora Hawes, who said she was surprised to see even recent city work completed that wasn’t accessible. Residents at the input session complained of maintenance deficiencies and the need for infrastructure work to prevent the flooding that plagues downtown streets. “Lipstick on a pig,” one commented. “Can you bring your own (maintenance) crew?” another asked Warner. The firm will produce an estimate for maintenance costs for the city to work with as plans are finalized, Warner said. Warner said while feedback has come in on either side, the firm hasn’t made a final decision about whether to recommend removing the sunken parking bays in the Broad Street median, a proposal from the November concept drawings. Retired Realtor David Penix lamented destroying the bays, designed by renowned architect I.M. Pei in the 1970s, saying it “destroyed art” that generates interest in downtown. The sunken bays, prone to drain clogs and ponding during rains, become “nasty,” commented Commissioner Sean Frantom, who held an earlier session Tuesday on moving the James Brown statue in the Broad Street median to the Augusta Common. James Brown Plaza was the subject of a Cooper Carry redesign from a year ago, and November plans showed it moving down Broad toward James Brown Boulevard. Warner said he wasn’t sure what the current status of the statue was. Regardless, “downtown is going to boom,” Frantom said, with ongoing development of hotels, apartments and the Cyber Innovation and Training Center announced last week for riverfront property at Reynolds and 13th streets.